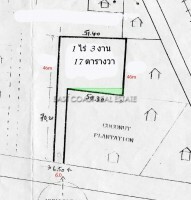 Land in Nongpalai. This large plot is just under 5 Rai and is a very usable shape to maximize this development plot. There is direct road access straight inside too and immediate access to the Bangkok Motorway 7 or the industrial hubs of Rayong, Amata or Laem Chabang. This could be a perfect small development plot, as the neighboring plot has already been built on with a small high end secure village. Of course at this price there will be some need for clearing the land, but considering the access to the land this is still an attractive opportunity for someone. 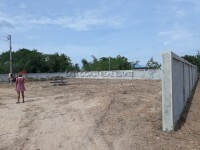 The land title is owned in Thai name, and arrangements to split the transfer fees 50/50 have been accepted.